Wood has a warm and welcoming quality. We have lovingly crafted timber into stylish designs made specifically for your home for just over three decades. The product you buy from us is manufactured from carefully sourced sustainable red wood timber grown in Scandinavian forests. Environmental responsibility is essential and we recognise this with our raw materials. 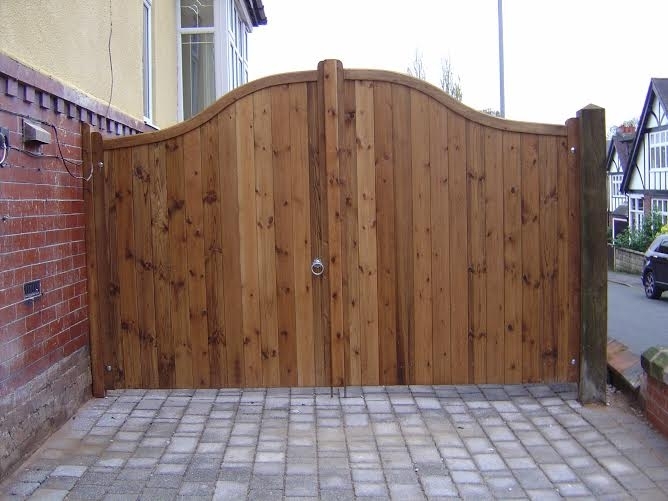 Our gates are made from PEFC and FSC certified wood. You’ve spent a lot of time and effort to grow a fantastic garden for all seasons, only to be let down by a tired garden gate. A bespoke timber garden gate will sit perfectly amongst the beauty of your garden. Available in three treatment colours, you can choose either red cedar, brown or a clear preservative which shows off the natural appearance of the wood as if untreated. See our range of styles to suit your garden. Driveway gates need to give security and privacy. The designs we build at B&K Timber combine the strength and durability you expect in a driveway gate with elegant styling to suit a domestic setting. Choose from swan shaped sweeps and convex shapes to enhance the entrance to your home. Bespoke timber gates for your driveway come in three shades; red cedar, brown or clear preservatives. Ordering your gates from us can be done in 4 easy steps via the B&K timber website. If you have any questions about our product and service, please contact us and we’ll be happy to advise on all aspects of bespoke timber gates.